This book is written and illustrated for all levels of mariners from the perspective of a professional pilot who regularly transits Wrangell Narrows. The illustrations are the heart of the work, while the manuscript is secondary. It is the author’s intent to enlighten the reader about the intricacies and potential dangers of Wrangell Narrows. I have presented a view of the Wrangell Narrows as a pilot with significant experience in these waters. Sharing my knowledge and illustrations will help facilitate safe passage for mariners of varying abilities. The casual reader may also glean information about the complex characteristics of this passage and the skills required of the mariners who travel here. In particular, it will benefit developing professional pilots of this waterway. I hope this becomes the standard of transit and that it serves you well for many years. Wrangell Narrows is a convoluted stretch of hazards to navigation strewn about a 22-mile waterway connecting the southeast side of Frederick Sound to Sumner Strait in the middle of Southeast Alaska. The intricacies in this body of water are countless. The original Wrangell Narrows was a short reach within Wrangell Strait. 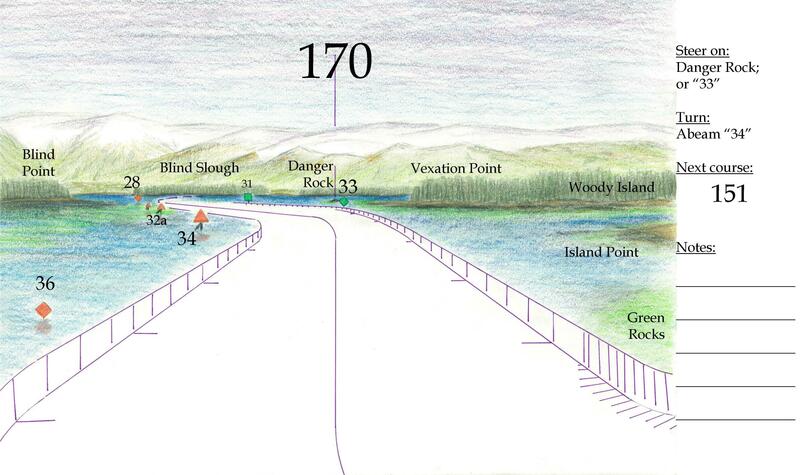 Wrangell Narrows was the reach between Burnt Island and Mitkoff Island, past and around “the spiked rock” (Spike Rock). The shores of Burnt Island and Mitkoff Island lace the reach with ruthless shoals leaving no room for error. 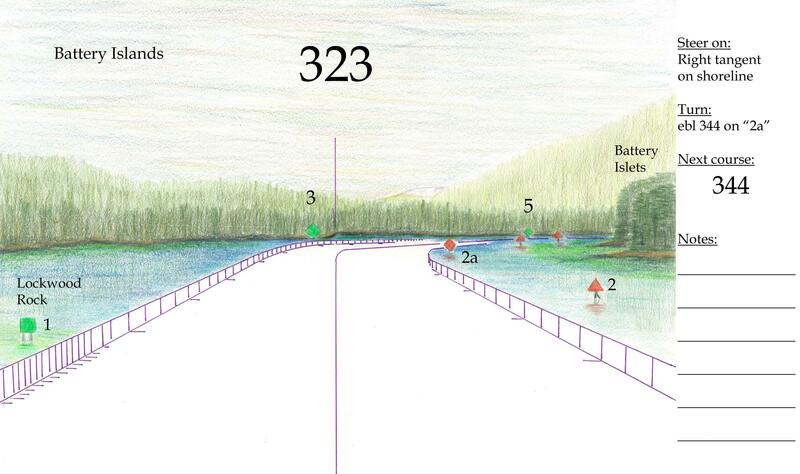 Thus, mariners referred to this section as “the Wrangell Narrows”; nowadays, it is the Burnt Island Reach. 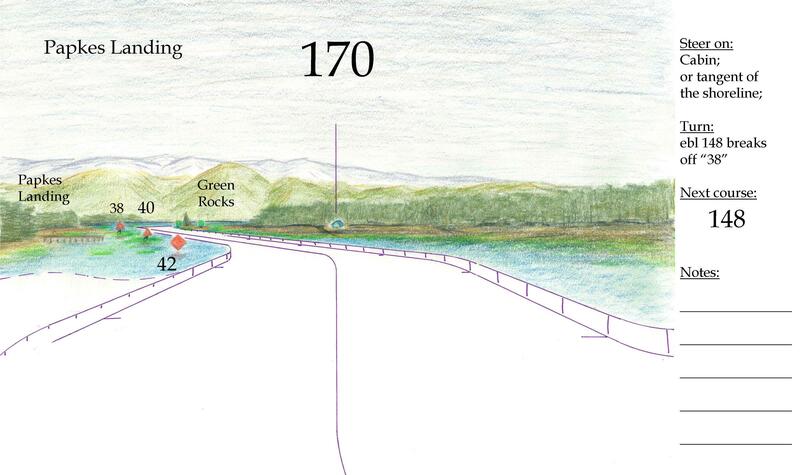 Wrangell Narrows, old Wrangell Strait, remains challenging to transit with tonnage vessels. It is considered by many Professional Pilots to be among the most, if not the most, difficult body of water in the world to pilot ships or tugs with tows. Its depths, shoals, rocks, swift currents, tidal extremes, and even the Aids to Navigation (ATON) provide ample hazards for the mariner. A casual approach to conning a tonnage vessel through Wrangell Narrows is not even a consideration. That view of the waterway rightfully meets a wall of resistance with the Alaska Marine Highway Masters. Conning a vessel in Wrangell Narrows is risking lives, the ship, and one or more licenses. When you can transit Wrangell Narrows in your mind with all the right conning answers while quietly duplicating the Pilots commands, you would be ready to begin the conning level. Excerpts of the 51 drawings…. To err is not only human, but also inevitable in Wrangell Narrows. Minutes earlier, the vessel entered Wrangell Narrow northbound with the fog in its usual fashion, thick. She rounded Lockwood Rock and began the semi-circumnavigation of the Battery Islands. The Captain was both the pilot and conning officer. He was a senior Master with decades of experience. 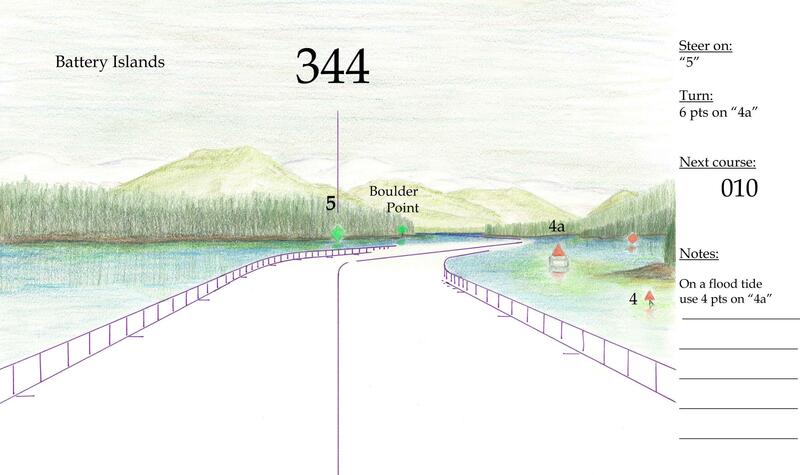 Right rudder was ordered to begin the turn to 344. Almost immediately the bow lookout reported “Flashing red, port bow.” “Red buoy, port side” was repeated by an alarmed crew member of the bridge watch team. The Captain quickly began a backing bell as the ship went full astern and the buoy proceeded down the wrong side. Seconds later, buoy 2a was struck and a paint swap began with the port side of the hull. The ship’s momentum continued until the buoy rolled well past amidships. Then, the vessel stopped with the buoy pressing against the hull. It became obvious to the Captain that at this point the only way out was forward. Luckily, there was no hull strike with the island at spitting distance on the starboard hand. The ship accelerated and re-entered the channel bound for Petersburg. “Seemingly ‘irrational’ behavior of the ship can be explained, predicted and anticipated.” Henry H. Hooyer, in Behavior and Handling of Ships. Any combination of two or more of these motions. All these motions come into play in Wrangell Narrows. 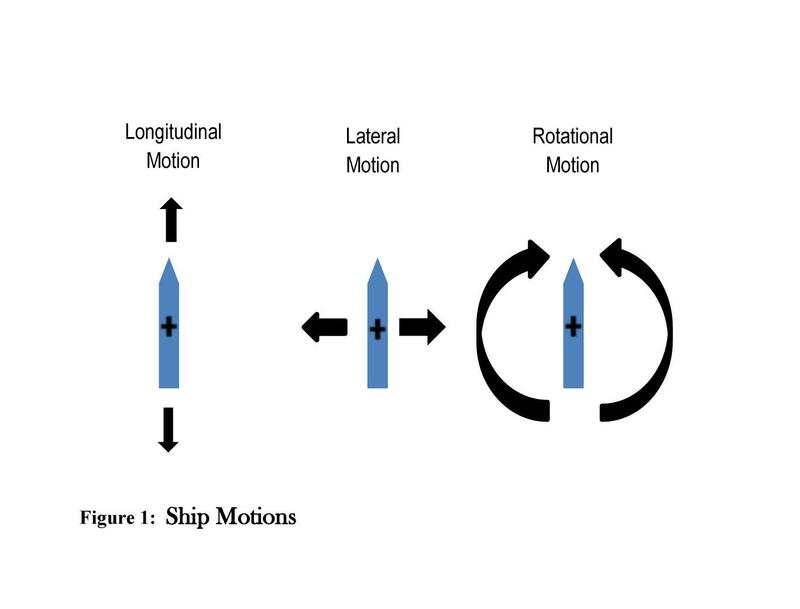 A ship in motion creates a hydrodynamic chain reaction. Early actions of (a) weighing potential difficulties and (b) considering counter-measure options are required to reduce risk produced by a ship’s motion in shallow water. Equally distant banks on both sides of the ship or no bank at all would be a better option in a transit of shallow water. Either of these conditions would reduce some effects felt during transit. However, most reaches of Wrangell Narrows are laced with nearby shoaling. The transiting mariner must be quick to prevent the resulting effects from becoming violent. A vessel that planes, skims the surface of the water. These vessels ride over the water and not in the water (i.e. speed boats, water skiing boats, etc.). Displacement vessels move through water, not over the water. As a displacement vessel in transit moves forward, water is sliced by the ship’s cutwater. The majority of the water parts and is displaced laterally. Not all water is immediately displaced. The un-displaced water forms a bulge forward of the bow. These non-parted waters stack and form a cushion known as a wave of displacement. The built up bulge of water is a bow cushion of resistance. 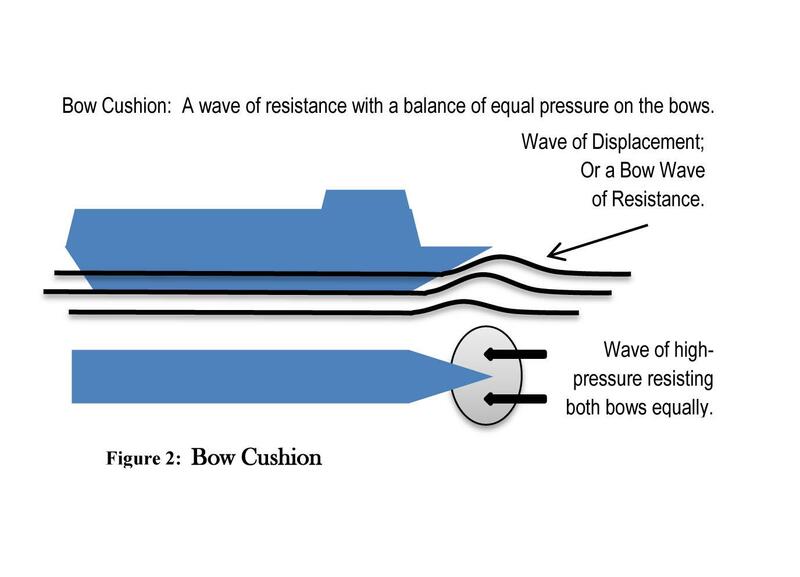 The bow cushion is a balance of waves of equal pressure on both sides of the bow. Speed, shallow water and trimmed by the head increase the bow cushion. This resisting pressure reduces the vessel’s forward motion by an estimated 25% to 30% of the ship’s power. Shallow waters increase the effects of the bow cushion. “Bank suction…is caused by the Venturi effect between the ship’s side and the bank. This can be amplified by the action of the ship’s screws, particularly in a twin-screw vessel, evacuating water between the ship and the bank.” Captain James A. Barber Jr. USN (Ret. ), in Naval Shiphandler’s Guide. Bank suction is the lateral transfer of the mid-body of a vessel near a shoreline. A low-pressure area abeam the transiting vessel draws the vessel shoreward. Lack of planning may result in a grounding attributed to the bank suction (Lateral transfer). Lateral transfer begins as the mid-body of a passing vessel descends into the low-pressure gradient between the vessel and the shore. Lateral transfer results from the Bernoulli Effect. “An increase in the velocity of a fluid…causes a decrease in pressure” (Barber). 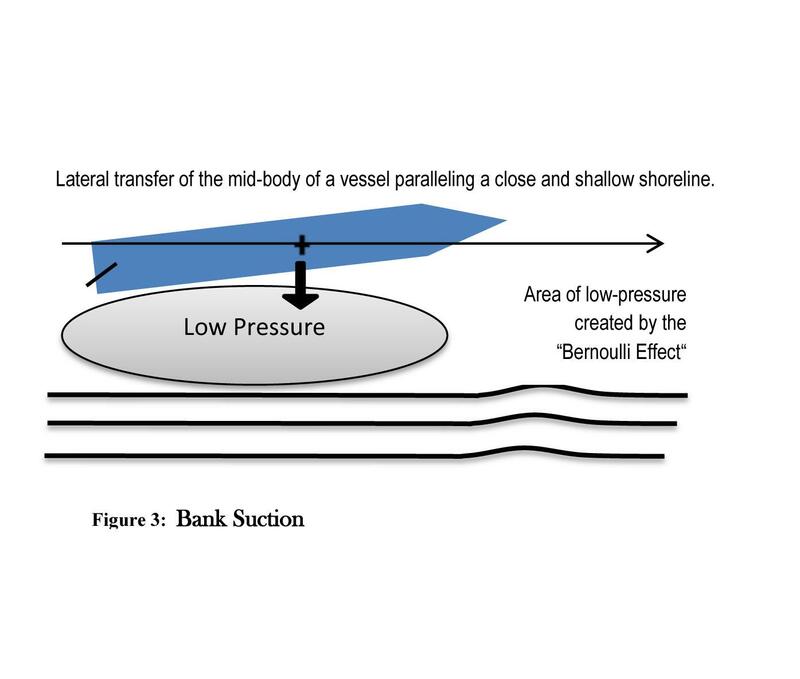 Bernoulli, summed up, essentially states: high-pressure moves to low-pressure; or a transiting vessel is drawn toward a parallel shore in close quarters. The following is a partial list of known shipwrecks and incidents that have occurred in the 22-miles of Wrangell Narrows. 1840 Unknown Russian vessel grounded and total loss at “Fairway Islands” (Green Rocks). Wreck and location are unconfirmed by experts. 1895 SS City of Topeka; stranded and recovered. 1899 SS City of Topeka; stuck a rock; salvaged and repaired. 1901 Barge Colorado; struck what is now named Colorado Reef on the Blind Slough range. The “barge” was the converted hull of a sailing ship bark. The Colorado was visible for decades after she met her fate. 1903 SS Excelsior; burned, flooded, salvaged and repaired. 1905 SS Spokane; struck bottom. Spokane met her fate in Seymour Narrows in 1911. 1907 Fishing Steamer Alice; struck a rock and sank off Danger Point; later raised and repaired. 1792 Captain George Vancouver of the HMS Discovery explored southeast Alaska and concluded the waterway (Wrangell Narrows) terminated in a cul-de-sac. 1838 The Russian explorer Captain G. Lindenberg aboard the Prince Menshikof, produced the first survey of the Wrangell Narrows. Lindenberg named much of the local geography that exists today. He also provided the original name “Proliv Vrangelya” (Wrangell Strait) after Barron Ferdinand Petrovich von Wrangell. The Baron wanted to expand his personal territory by simply adding his name to the waterway. By naming the waterway, he intended to remove all doubt as to ownership when foreign vessels arrived. 1850 The first sketch of the waterway was recorded on Russian chart #1441. 1867 Alaska was purchased from the Russians for $7.2 million or about 2 cents per acre. 1869 The first US Coast Pilot was published that included entries of Wrangell Strait. The original Coast Pilot described the waters as follows: “It is tortuous, very narrow, has low wooded shores, broad beaches, and a mid-channel depth of not less than four or five fathoms.” It further states that the waterway is used by the USS Saginaw and other US government Steamers. This marks the first noted regular use of the channel as a main thoroughfare for steamers, the larger vessels of that era. The first US chart (#225) of the waterway was produced from the first US survey by Captain W. Meade of the vessel USS Saginaw. The Saginaw was the first larger US vessel to transit the waterway. Meade was directed to correct Lindenberg’s errors. Meade’s observations were later published on the first US chart the same year. 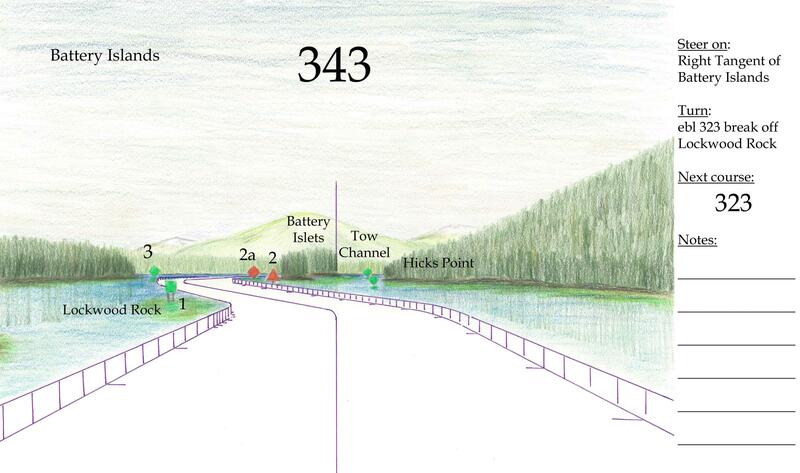 Among the corrections made was where Lindenberg identified Duncan Canal met Wrangell Straight in the vicinity of Boulder flats, behind Woody Island. Meade corrected it to the proper location of Keene Island. Meade states “I cannot consider Wrangell Strait a difficult passage for a vessel of fifteen feet draught. The soundings are very regular, the turns easy, except near the mud flats, and the tide is not very strong anywhere.” Meade was in error on almost all points. Conclusion of excerpts taken from the book…. I have looked around at the excerpts. Very well done! It sounds not only informative, but interesting. Thanks for letting us know about it. 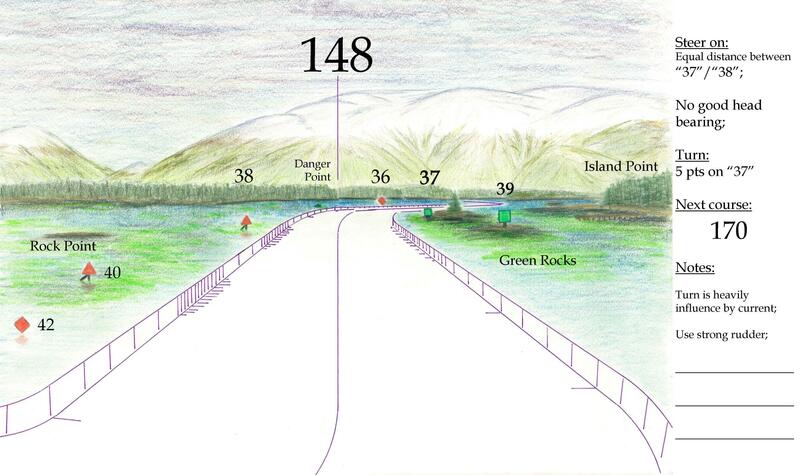 Okay, my comment has nothing to do with the intricacies and potential dangers of Wrangell Narrows. I know that they exist and am I constantly amazed about how the pilots navigate as fast and as well as they do aboard any one of the Alaska Marine Highway’s ferries. Including you Lou! I just want to say that when I was an oiler on board the Matanuska, I experienced the Wrangell Narrows first hand, sticking my head out the round port hole in the oilers room, above the bow. The weather was totally clear and the sun was setting in maybe an hour. The sound of the water being cut across the bow, the water passing beneath, the sound of seagulls, the close proximity of the trees passing by, the rich smell and the wind blowing through my hair has stayed in my memory for all these years. I should have been sleeping, but the experience was worth it!